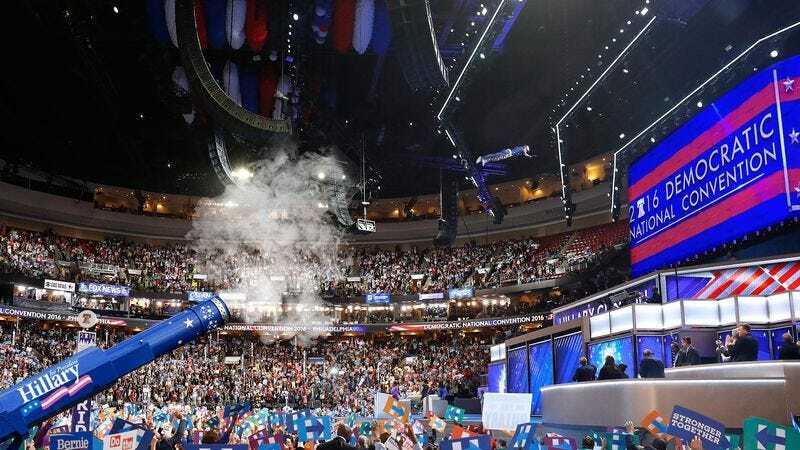 PHILADELPHIA—Noting that the vice presidential nominee had been launched nearly 100 feet into the air during his entrance into the Democratic National Convention Wednesday night, sources reported that the cannon at the back of the Wells Fargo Center had accidentally overshot Tim Kaine across the arena, sending him crashing to the stage several dozen feet beyond the erected safety net. “You could see him really flailing his arms as he flew over us before tucking into a somersault and slamming into the large video screen at the back of the stage,” said Minnesota delegate Carson Bremmer, who told reporters that the Virginia senator, clad in a star-spangled jumpsuit and helmet, received thunderous applause from the 18,000 people in attendance, who at first simply assumed the collision was part of the act. “When I saw that he was lying completely motionless, I realized something might have gone wrong, and then the paramedics rushed over to help him. After a few minutes, he climbed to his feet and gave the crowd two thumbs up, and the whole arena went nuts.” Sources confirmed that after a brief evaluation by medical personnel, a calm and composed Kaine then began his speech on the themes of hope, perseverance, and integrity.